Relatively few people will read the nearly 400-page special counsel report. Many will cherry-pick information to support their current opposition to the president. Here’s what is reasonable to expect from it. A close look at recent filings in the CNN open records lawsuit against the FBI suggests that the DOJ has already closed senators’ criminal referral of Christopher Steele. We’re in an era where politicians and the media cheer on (and cover up) actions resembling third world police state activity that further their political cause. 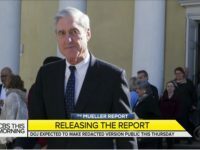 Doubling down on accusations and demanding the un-redacted Mueller report is no substitute for collusion myths, but Democrats’ inability to let it go helps the president. Attorney General William Barr said in testimony before a House subcommittee that he is conducting a broader investigation of how the Trump-Russia collusion narrative started. How did the doyens of media fail so spectacularly for two years on the matter of Trump-Russia collusion, while anti-establishment journalists and media neophytes succeeded? The bad news for Trump is that Schiff is the chairman of the House Intelligence Committee, and he’s dropped any pretense of accepting a Mueller decision as the final word on collusion. In pursuit of a smoking gun that would validate their discontent with the president, media used trumped-up information to lead Americans into hating their friends and loved ones. With the possible exception of former CIA director John Brennan, no one had a more uncomfortable post-Mueller report release than one James Comey. There was Russian collusion during the 2016 presidential campaign, but it didn’t come from Donald Trump. Why does CNN’s Jeff Zucker claim that the organization and its wide array of journalists are not investigators while simultaneously touting themselves as investigators? Expect the left to train their fire on a memorandum Barr authored and sent to the Department of Justice in 2018. A society cannot survive without accountability. There must be a reckoning for those who tried to delegitimize democratic mandates and fuel hysteria.